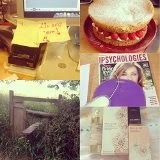 Last week I took a 5 day work experience placement at Psychologies Magazine. I had first day nerves on the Monday but they were soon settled by the warm welcome I received. I had so much fun over the week due to the program they set up for me and 3 other work experience students. We were set tasks such as taking live twitter interviews, typing up old articles to upload on to the website, a review of a book to post on the company's blog, to sit in meetings, to create the dummy magazine wall and to sort through the beauty press releases. We were really lucky as it was lovely and sunny all week so we went for country walks at lunchtime. I really enjoyed my work there and I now know that I want to pursue a career in journalism.
. Stand up straight with your hands out of your pockets.
. Talk with a certain confidence in your voice, but remember there is a fine line between confidence and arrogance.
. Pluck up courage to speak to others in your work placement, ask questions and get to know them better.
. Practice good eye contact and body language - perhaps in a mirror beforehand.
. Show enthusiasm in your work placement by completing tasks to the best of your ability - however small they may be.
. Dress smartly or correctly for your sector of work - for example if you are turning up to a kitchen ensure you have your apron, or if you are working on a building site make sure you wear your boots and hard hat.
. Get to know the company or people you are working for before you go - getting to know them better means you can join in conversations and it also shows interest in the company.
. Get a good nights sleep the night before so you are not tired on the first day. You yawning over your late night, might come across that you are bored or unimpressed.
. Be organised and punctual - first impressions mean a lot.
. Have fun and smile!